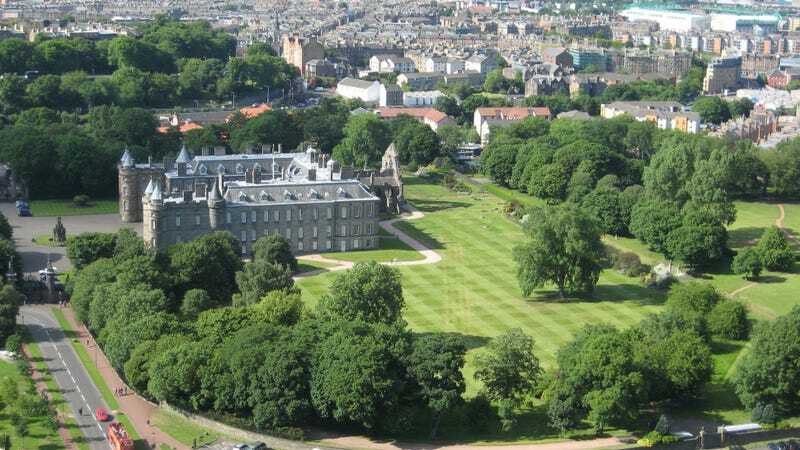 During a recent survey of trees in the Queen’s garden at the Palace of Holyroodhouse in Edinburgh, Scotland, botanists were shocked to discover the presence of two elms thought to be extinct for nearly a half century. The two trees belong to a species known as the Wentworth elm, and scientists thought it had gone extinct last century on account of the Dutch elm disease epidemic. Turns out they were wrong—but what a strange place for the last two remnants of this majestic breed to be located. It’s not as if these things are tiny saplings, or trees tucked away out of sight. They’re absolutely huge and are among the most photographed trees on the palace grounds. “Such a discovery when the trees in question are just shy of 100 feet and in plain sight does sound rather odd,” admitted Max Max Coleman of the Royal Botanic Garden Edinburgh (RBGE) in a release. Coleman identified the specimens after they were flagged as being unusual during a recent tree survey. The trees have a weeping-like appearance, and feature large glossy leaves. Speaking to the BBC, Coleman speculated that the oversight could be blamed on the fact that these trees were never common in the first place. “If you pull your tree book off the shelf to try and look them up, you won’t find Wentworth elm listed in the books,” he said. Coleman also believes that few people these days are able to identify sub-species of elms because of how rare they are. He says that somewhere between 25 to 75 million elms across the UK were lost in the 1970s on account of Dutch Elm Disease. Coleman attributes the survival of these two trees to a conservation effort invoked nearly 40 years ago. The queen’s botanists are now trying to figure out where these elms came from, but a preliminary investigation suggests they were introduced by the RBGE during the late 19th century. More importantly, they’re also looking into ways to preserve and propagate these last two remaining specimens.